You are at:Home»Herbs»Morus nigra Linn. Latin name : Morus nigra Linn. Description : Black mulberries contain some of the most powerful and effective antioxidants, Anthocyanins and Flavonoids, which help to improve blood circulation, neutralize free radicals, improve the body’s immune system and give the fruit its darkred to purple color. Mulberry contains fiber, calcium, phosphorus, potassium, magnesium, carbohydrates, iron band proteins essential to one’s good health. Black Mulberry helps in containing hypertension. Black Mulberry is helpful in treating constipation. Black Mulberry is instrumental in eliminating abdominal distention. Black Mulberry is helpful in recuperating after long-time sickness. 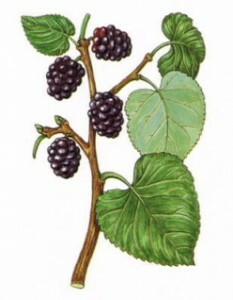 Use of Black Mulberry keeps low cholesterol level in the body.Black Mulberry can suppress mutagenesis of carcinogens. Black Mulberry is helpful in reducing level of blood sugar. Regular use of Black Mulberry enhances appetite, and also improves the ability for digesting and assimilating. Contraindication : This has no known cotraindications.